With the arrival of the Catechism instruction season, it’s as good a time as any to think for a moment about Catechism instruction. 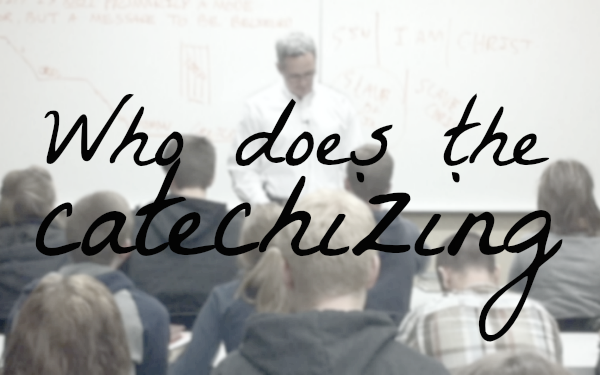 Specifically, who is responsible for catechizing the youth? The question is an important one, if only because the answer may involve some change of habits. You see, parents and church both have a role here. He will be their caring Father, giving them only what is good and directing the things they experience as bad into something beneficial. Sinners never deserve such grace, and so this bond of love is possible only because of Jesus’ Self-sacrifice on the cross; in fact, in this covenant of love the Lord God promises not to deal with sinners as we deserve, but to forgive our sins instead. Since sinners by nature are allergic to God, the Lord even promises His life-giving Spirit to make these sinners delight in God’s goodness and live a life that shows appreciation for this divine grace. We hear these three points repeatedly from the Form the Baptism of infants. We’re well aware that we’re meant to respond to God’s delightful claim upon us with the outstretched hands of faith. God’s claim of ownership includes not just adults but also the children He in wisdom entrusts to the care of believing parents. God doesn’t ‘throw the switch’ in these children when they turn, say, 18 so that they suddenly believe; God instead uses the parents to whom He entrusted these children so that they might teach them to take God for real and trust Him in the midst of life’s questions and struggles. So God said concerning Abraham, “I have chosen him, that he may command his children and his household after him to keep the way of the Lord by doing righteousness and justice” (Genesis 18:19). Moses repeated the sentiment, “These words that I command you today shall be on your heart. You shall teach them diligently to your children, and you shall talk of them when you sit in your house, and when you walk by the way, and when you lie down, and when you rise” (Deuteronomy 6:6,7). “Sit in your house” is today a reference to speaking with your children about what you see on TV or on the computer screen, and “when you walk by the way” is today a reference to the conversation that happens in the car on the way home from that hockey game. This mandate to parents forms the reason why the Lord gave the children the command to “honor your father and your mother” (Exodus 20:12). Honoring involves an attitude of openness to Dad’s and Mom’s instruction. All of it receives an echo in Paul’s words: “Children, obey your parents in the Lord, for this is right…. Fathers, do not provoke your children to anger, but bring them up in the discipline and instruction of the Lord” (Ephesians 6:1,4). God has obviously given to parents a vital role to play in the spiritual development of His children-by-covenant. The consequence of the above is, of course, that parents are responsible first of all for Catechism instruction. The minister (and elders) did not swear an oath at baptism concerning the children in the congregation; it was the parents who “promise[d] as father and mother to instruct your child in this doctrine.” But the responsibility does not stop at ‘instructing’; parents are also to teach their children how to respond to God’s gracious claim on them. God told the people of Israel that they had to make a confession of their faith (see Deuteronomy 26:5-10. This response was to be personal and spoken by one’s own mouth – and that meant it had to be memorized. Here was –and remains– a task for parents, both in teaching doctrine and in assessing memory work. In both aspects parents have the God-given primary responsibility. This instruction is to happen “when you sit in your house, and when you walk by the way, when you lie down, and when you rise” – in other words, any time and all the time. Yet the kitchen table, when the family is gathered to eat (that happens faithfully in your home, I trust), provides an ideal opportunity to speak about the will and promises of the Lord in the context of the day’s experiences. It’s also so very helpful to add reciting the Catechism to the devotions that belong to every meal. So, beside the Scripture reading and discussion, prayer and singing (be it the psalm assigned by school or a free selection), take time to recite a Lord’s Day with the family each and every meal. The younger the family starts with this habit, the more familiar the children are with the Catechism and the easier memory work becomes. The conclusion follows from the above that parents have primary responsibility for teaching their children the way of the Lord, ie, teaching them the material of the Catechism. There is, however, a second party involved. The ascended Christ gathers His church, and that’s to say that He assembles His people into a flock that belongs together and habitually gathers Sunday by Sunday. It’s a fact that not every believer in fact belongs to Jesus’ church yet; Jesus Christ gathers some of His sheep to His flock very late in life (cf John 10:16), perhaps even at death. The members of the Canadian Reformed Church of Smithville, however, have received from the Head of the Church the advantage to be joined to His church already; even the children fully belong to this church of His. That, we need to know, is very much a privilege. As the Good Shepherd, Jesus Christ tends His sheep, and does that through the work of under-shepherds. That tending occurs through the preaching Sunday by Sunday; older and younger alike are fed on the nutrition of the Word in the midst of life’s concrete questions and challenges. Of course, parents may need to break the sermon down to bite-size bits for their younger children, but that doesn’t take away from the fact that the Good Shepherd cares also for His lambs through the weekly preaching. That’s why the children of the congregation belong in church as soon as they can sit reasonably still, and not be asked to leave for a child-size service once the sermon begins. The responsibility of the under-shepherds (that’s all the elders) is, however, not limited to the preaching of the gospel. The apostle Paul told the elders of Ephesus to “pay careful attention to … all the flock, in which the Holy Spirit has made you overseers, to care for the church of God, which He obtained with His own blood” (Acts 20:28). Of course, the phrase “all the flock” refers not just to the rams and the ewes of the congregation (ie, the adult men and women), but also to the lambs and all those in between. Elders, then, have a responsibility to the teenagers of the church. These teenagers are approaching the age of accountability, when the Lord wants them to give an answer to the riches God promised them in the covenant He established with them in their infancy. It’s now precisely to help these children-of-God-by-covenant respond fittingly to God’s promises that the elders organize Catechism instruction for these Young People, and appoint an instructor to teach these youth what God has revealed in His Word. This instruction commonly penetrates to higher levels of knowledge than what parents usually attain in the home. Providing catechism instruction is part and parcel of the elders fulfilling their mandate to “care for” the younger sheep the Lord entrusted to them. That’s in turn why the elders periodically visit the Catechism classes as well as inquire at home visits about how the youth are responding to the instruction they receive. And given that the Lord God is caring for His younger sheep through the elders (including the Catechism instruction they offer), it follows that the youth are to receive the elders readily and be open to them about how they feel in relation to the instruction received. So then, the catechizing of God’s children-by-covenant has undoubtedly happened all summer long under Dad’s careful instruction (and Mom’s) in the home. The time of year has come to augment the parents’ work with the seasonal church instruction. My work as instructor in Catechism class, then, is obviously not intended to replace parents’ work, but is intended to assist the parents in their calling. To that end I’ll try this year again to dovetail the classroom instruction with Sunday’s preaching; that way parents know what’s been taught and can speak about it further with their children – and grandchildren. May the Lord God richly bless the work of catechizing, both what parents do in the home as well as what office bearers do in the church.